Last summer, Matt Marsden gave up his steady job at a hospital to peruse a personal dream of becoming a full-time professional cut man. With one full calendar year under his belt, we check in with Marsden to see how life on the road with Bellator has been treating him. "It's worked out even better than expected," he said. "I'm full time with Bellator, I get guaranteed shows. With Fight Master and regional shows, I have even more events than I could hope for." The new profession has already begun paying dividends in Marsden's personal life. "I get to spend a lot more time with my wife," Marsden said. "I'm working a lot but I'm not working a 9-to-5, five to six days a week in a hospital like I was. I'm getting to do fun things, she's getting to travel with me. It's definitely changed my life for the better in that I'm much happier than I've ever been." Bellator's calendar is structured into seasons allowing for long strings of events followed by long breaks, providing for an extended summer vacation. "I work about three months for Bellator, then have three months off, that's the way it works." Marsden said. "They're good to me, and with other shows, and thankfully sponsors like Furious Brand, Tuffmed, and Everlast, I'm able to budget it out. I'm not living like a rock star, but I'm definitely able to hit the gym a little more and enjoy my summers off." Marsden's public profile has increased significantly since the debut of Fight Master, Bellator's reality show featuring hungry, fighters competing in a tournament like format for a guaranteed contract with and prize money. Marsden is seen prominently throughout Fight Master and it's this visibility plus his trademark beard that have gotten him noticed more than a few times now. "It's still kind of funny to me because I don't really expect it," Marsden said. "It just happened recently in a super small town in Wisconsin in an A&W hamburger stand. I was standing there eating and a kid who was like thirteen or fourteen came up to me and said 'I just saw you on TV last night, hey can I get a picture?'" Marsden is quick to dismiss his fame and point to the fighters as the real stars of the show, but its hard to miss his trademark beard and black shirt on any given episode of Bellator. "Between Bellator and Fightmaster, and I've worked some stuff on AXS TV," Marsden said. "I'm just happy to be there. The way I look has a little bit of recognizability. The bald head and the bear helps people remember my face a little bit I think." The origin of the beard goes back to his days in the Army where he wasn't allowed to grow facial hair. Then his work in the operating room also limited his options. "(At the hospital) I could have one, but it had to be super, super short," Marsden said. "Now I'm just going bananas with it." Marsden and a few of his colleagues recently started a podcast entitled Beards on MMA. 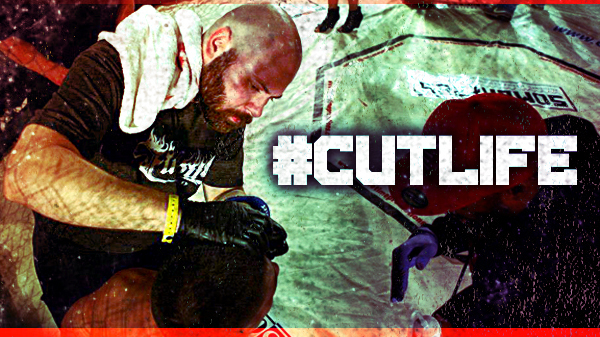 The cut man is joined by two other bearded friends as they discuss a wide range of MMA related topics with guests like UFC and Strikeforce-vet Pat Healy among others. With a full year under his belt, the newness still hasn't worn off. "I still get super excited and nervous, and I get startruck among all these big fighters." Marsden said. One of Bellator's sister companies on SpikeTV is TNA Wrestling. A weekly professional wrestling show that has seen the likes of Hulk Hogan, Sting, Ric Flair, and Kurt Angle take to the ring. Recently, some of the Bellator top talent has been showing up on TNA, specifically Rampage Jackson is getting some major screen time. Although there are no plans in place, Marsden isn't ruling out his own appearance on TNA. "Not that I know of right now, but we're getting so many MMA fighters over there right now, I can't rule anything out." Marsden said. "That would be pretty cool." It doesn't take you long after speaking with the affable Marsden to realize he's enjoying his place in life. Just don't text him while he's recording one of his podcasts.